Greece is now among the top 10 European countries attracting the interest of investors seeking to tap into the hospitality market, according to a survey released last week by property brokers Tranio for the 22nd edition of the International Hotel Investment Forum (IHIF). More specifically, over 200 industry professionals surveyed from 57 countries, including the UK, Germany, Spain, Russia, Saudi Arabia and the United Arab Emirates, ranked Greece 7th in terms of market attractiveness, with Spain (55 percent), Germany (54 percent) and Italy (42 percent) in the leading three. Factors winning over prospective investors include a stable economy and developed hospitality markets. Besides the upward dynamic as a leading tourism destination, Greece is evolving into an appealing investor destination in large part due to the potential of high returns. The country’s golden visa program, which offers five-year residence rights renewable for third country nationals who purchase individually or through a legal entity property in Greece valued at a minimum of 250,000 euros, has also proven to be an incentive. According to the joint Tranio and MR&H (Mediterranean Resort & Hotel Real Estate Forum) survey, more than half (54 percent) of the respondents said they would likely invest in Greece, 54.5 percent in Spain, and 25.5 percent in Italy. “Judging by the number of enquiries from our clients, Germany, Greece, the Czech Republic, as well as Spain, Italy, and France are the most popular destinations for hotel real estate investors. The Austrian Alps have also started to attract a lot of interest lately,” said Marina Filichkina, head of sales at Tranio. 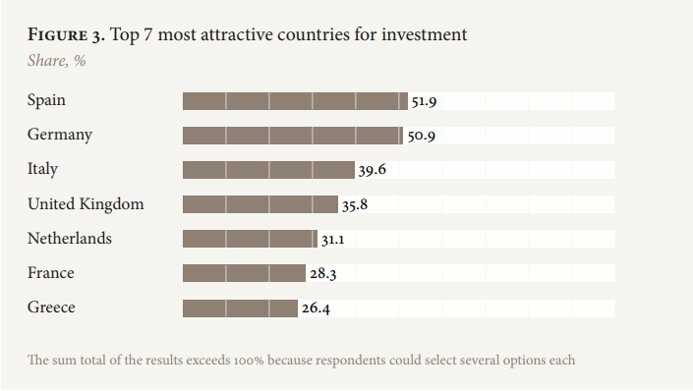 With regard to most popular investment strategy, survey participants said the focus would be on investments with higher yields, followed by value-added projects, particularly due to the fact that most investors are seeking to enter markets with growth potential such as Spain, Greece and Portugal and to a lesser extent Germany and UK, as demonstrated in the “Emerging Trends in Real Estate 2019” PWC report. Looking ahead, Tranio analysts are optimistic, noting that most investors intend to hold on to their property for longer periods and are willing to accept lower returns if that ensures stability. At the same time, a number of investors are monitoring rapidly growing markets looking for value-added, or risky projects that generate high yields. Next: Happy Greek Indpendence Day from Crete!